This section includes Palaeohispanic inscriptions from the southwest of the Iberian Peninsula that were collected in the third volume of the MLHs by Jürgen Untermann under the letter G. Following the publication of the corpus there have been new discoveries which have increased the number of inscriptions in this zone to more than 50. Some of these, a total of 12 (SP.01.08, A.04.09, V.17.05, V.20.01, V.18.01, A.03.01, MU.01.01 and .02, AB.06.01-.04), were collected by the same author in an unpublished supplement to his work. Later, 37 new inscriptions were published; a further 9 inscriptions, known prior to the work by the German author, have also been included in the database (A.10.05-.12 in Ramos Fernández 1969; AB.07.03 in MLI XXI* and Gómez-Moreno 1949, n. 79). Zone G includes the entire Spanish provinces of Murcia and Alicante as well as western Albacete and Valencia up to their natural border marked by the River Júcar. Its chronology covers a period from the 5th century B.C. to the 1st century B.C. Its most important sites are La Serreta de Alcoy, la Illeta dels Banyets in Campello (Alicante), Abengibre (Albacete) and Coimbra del Barranco Ancho in Jumilla (Murcia). The most utilised mediums in this region are lead and ceramics, as well as an important collection of silver crockery (Abengibre, AB.01) with five inscribed plates. Stone is also used as a medium in this region, although in a reduced number, since only five examples have been preserved (A.10.01, .02, AB.04.01, V.17.01, V.18.01). Lastly, one should point out two sites of rock epigraphy, the collection of El Abrigo de Reiná (AB.02) and La Camareta (AB.08.01). Some of the texts on lead, of a commercial nature, present sequential numerals that demonstrate the use of at least three different metrological systems in this zone. Apparently, there were two metrological systems used by Southern and Levantine scripts: a first system termed the "ka system" by de Hoz (2011, 192) and a second termed the "a, o, ki system" (de Hoz 2011, 193; Ferrer i Jané 2011, 101 ff. and 2013, 138 f.). The first system uses the grapheme ka followed by the numeral, indicated by a variable number of vertical traces (indicators of units), while so that, in Southern writing, vertically arranged points are used. The second more complex system combines the graphemes a, o, ki in a likely gradation from greater to lesser, like metrological units in the same system, given that they always appear in this order. This system has an outline: NP + suffix + metrological indication (a, o, ki) + numeric indication (vertical bars or points). Moreover, the third specific system of the Greco-Iberian script (MU.01.01, A.04.01) makes use of different signs to those of the graphemes in writing: Σ Χ < >. These marks must have been taken from Greek epigraphy, since generic parallels are found in Greek metrological systems. However, it is impossible to find in Greek systems the combination that Greco-Iberian uses with them in Greek systems (de Hoz 1987a, 294). Furthermore, this region has two mints: saitabis (Mon.35) and ikalesken - ikalensken (Mon.95). The first of these is south of the Júcar, in the municipality of Játiva, which in the Latin sources is termed Saetabis; it expresses its toponym in Iberian and Latin in its minting: śaiti/SAETABI (Mon.35) in Levantine/Latin script, beginning its activity at the end of the 3rd century B.C. On the other hand, the mint of ikalesken – ikalensken minted with both legends simultaneously. There are doubts over the interpretation of its fourth mark, which Villaronga (1980) reads as ku in Levantine script, although the script used for this legend is the Southern one; its location is uncertain, with suggestions that it is could be Iniesta, in Cuenca (Quesada - García Bellido 1995; Ripollès 1999), Illescas, in Toledo (Luján 2003) or a dual setting: Yecla in Murcia and Illescas (García Alonso 2007, 77). Its chronology incorporates the second half of the 2nd century B.C. and beginning of the 1st century B.C. This region, called Contestania by the Romans, a name perhaps based on indigenous ethnonym (Llobregat 1972, 9), is cited for the first time in sources from the imperial era. The first author that mentions it is Pliny (3, 19 ff. ), although Livy also provides a not very accurate reference which implies the existence of an ethnic group at a time predating Sertorius (de Hoz 2011, 39-40). Pliny mentions the region and some of its cities, and he situates it, indirectly, between Cartagena and the River Júcar. The second author that describes the Contestanian region is Ptolemy (2.6.61), who locates it to the east of the Bastetani and the south of the Edetani, on the coast, as well as providing a series of cities and geographical accidents, with some errors. Other authors who cite the zone indirectly are Strabo and Avienus. The former mentions a broad concept of Edetania, which reaches Cartagena, thereby including Contestania. The reference of the latter is dubious, given that his text seems to be corrupt (de Hoz 2011, 39-41). The corpus respects the ordering established by Untermann in his MLH III, even when some inscriptions taken as Iberian by Untermann have been interpreted in another way by later research (e.g. the inscription of Elda, G.11.01, identified recently as Byzantine). The references in the Hesperia Data Bank are made up of the initial letter of the province, followed by the number assigned to the municipality and the number of the inscription. 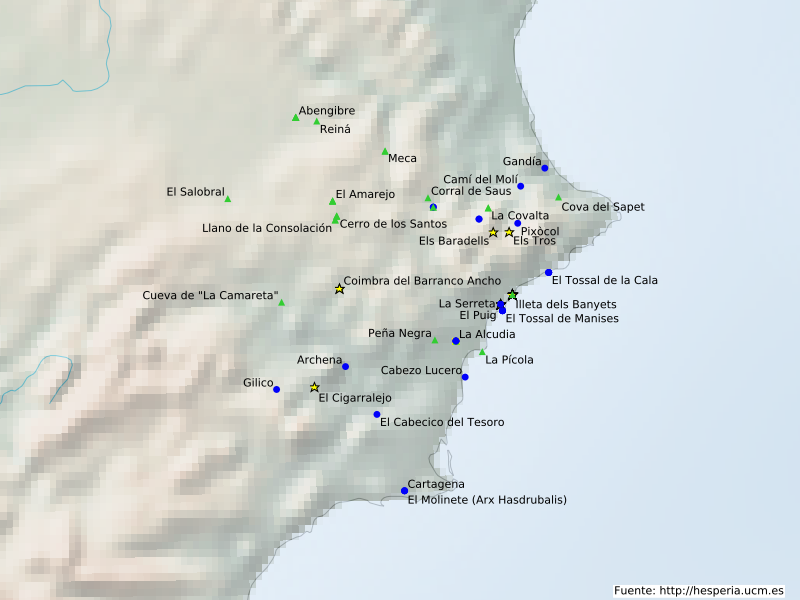 In contrast to the MLH, Hesperia Data Bank groups together inscriptions by municipality, and not by site; that is, in the case of Alcoy, which has the sites of La Serreta, Puig and Els Baradells, all the inscriptions from these sites in Alcoy are collected under the reference A.04. See a table with the Hesperia reference list used for Contestania. One of the most important cultural features of the region of Contestania is its Greco-Iberian writing, created in this region and used almost exclusively there. However, at the same time, Contestanian epigraphy also made use of Southern and Levantine scripts as well as the Latin alphabet. In this last form of writing the only attestation is an inscription on a mosaic from La Alcudia de Elche (A.10.04). Greco-Iberian writing has been known since 1921, with the appearance of the lead of La Serreta de Alcoy (A.04.01) which was published by Gómez-Moreno in 1922 already as an Iberian text drawn up in an adapted Greek alphabet ("De epigrafía ibérica. El plomo de Alcoy", Revista de Filología Española 9, 341-366). In effect, this writing is an adaptation of Ionian Greek writing in order to write in the Iberian language. Its use was restricted both chronologically and geographically, since it only existed for just over a century, from the end of the 5th century B.C. to the beginning of the 3rd century B.C., and it is only documented in the provinces of Alicante and Murcia, with the exception of two isolated testimonies outside the Contestanian territory: a lead in Sagunto (V.04.29) and a ceramic found in Gibraltar (GIB.01.01). The appearance of Greco-Iberian writing took place in a social and cultural context characterised by the presence of bilingual peoples linked to the existence of a prolonged commerce between Greeks and Iberians. The adaptation of the Ionian Greek alphabet, which took place in order to write the Iberian language, consisted of eliminating letters that annotated non-existent sounds in Iberian: the labial voiceless occlusive (Π), aspirated consonants (Φ, Θ, Χ) and double consonants (Ψ, Ξ, Ζ). Besides the Greek letters which served to differentiate vowels between short and long (Epsilon, E, as opposed to Eta, H, and Omicron, O, as opposed to Omega, Ω), Iberian could dispense with two of them given that it did not have the vowel quantity, choosing the Omicron for /o/ and the Eta for /e/. In contrast, Iberian possessed two trills and two sibilants for whose expression it adopted two distinct methods: a) in the case of trills the difference was expressed via the use of the Greek Rho for one of them, that transcribed as ŕ, and the Rho with the addition of a diacritic stroke for the second trill, transcribed as r. In this way the coherence of the transcriptions and , respectively, from Levantine is maintained. b) for the sibilant that we transcribe as ś they used the Greek Sigma, while for the second sibilant, transcribed as s, they reused a mark, the letter Sampi (ϡ), which was probably not yet in use as a grapheme in the Ionian alphabet, although it did have a numerical function. In this case, too, the transcription of the sibilants maintains a coherence wit that used for its corresponding marks signs in Levantine: the Greco-Iberian Sigma = the Levantine San; and the Greco-Iberian Sampi = the Levantine Sigma. In Contestania, Southern writing was extensive, both chronologically, from the 5th century B.C (V.17.1, Corral de Saus) to the 1st century B.C. (AB.08.01, Cueva de La Camareta), and geographically, given that there are testimonies to it in all the provinces in the region, except Murcia. Out of all of them, Alicante possesses the least number of testimonies, while Valencia and, above all, Albacete, are the provinces with the greatest number of epigraphs written in this script. There are still doubts over the interpretation of some marks signs, so that one may come across different transcriptions according to the author. This is reflected in the text section in the files of inscriptions in southern writing, where the most significant interpretations by different authors are presented. The normal direction of writing is from right to left, but some of the later inscriptions were written from left to right, possibly through Latin influence. Moreover, it should be pointed out that this writing has a palaeographic variety attested only in Andalusia, corresponding to the H zone in the MLHs and which will be discussed in more detail in its introduction. For the moment, it is only documented in four inscriptions in this zone: the lead of Gádor (AL.01.01), a lead cover from Arjona (J.07.01), a lead in Los Allozos (GR.01.01) and an inscription possibly from Alcolea del Río (Luján – López Fernández 2017). It is uncertain whether Southern writing differentiates the feature of sonority in occlusive syllabaries or any other phonological feature in the other syllabaries, despite the existence of marks marked signs in some inscriptions. Ferrer i Jané (2010a; 2012d; 2013a, 446 f.) argues in favour of their existence. For this author, the distinctive added stroke in the differentiation, a line or a point, would serve to annotate a voiced rather than voiceless occlusive, in contrast to what happens in the Levantine script and, what is more, in Southern writing some kind of phonetic distinction would not just affect the occlusive but also the nasal, trilled and sibilant sounds. Whatever the case, our transcription has not differentiated between marked and non-marked features. Finally, Levantine writing, together with its southern counterpart, is the most used writing in the Contestanian region. Its chronology extends from the 4th century to 1st century B.C. and geographically inscriptions in all the provinces of Contestania, except Albacete, are preserved. Zones B, C, D, E y F and K, that is, Celtiberia, also made use of this writing, with a specific adaptation. In the case of the Southern script, moreover, given that we do not have a unitary or complete corpus to date, in the critical apparatus different interpretations are presented according to the system of transcription of the different editors. In the following link the reader can see a table of this script with all the existing signs and the transcription of those in whose transcription there is agreement among experts. Map 1: General overview of sites in Contestania with their Hesperia reference.